Who doesn’t love a stack of freshly cooked pancakes! And who doesn’t love experimenting with toppings?! 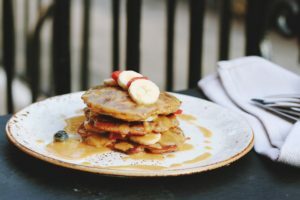 Here, we have compiled a list of toppings that will give you the South African spin on your pancakes. Minimalist Sugar & Lemon: Maybe you satisfy your sweet tooth with simple sugar and lemon. It’s a classy classic! Bold Chocolate Lover’s Choice: Nestle Milo Powders are a South African favourite! Enjoy stirred in with milk, hot or cold but always with a pancake or two. Fun & Jammy: All Gold Jams come in a range of delectable flavours that are perfect for spreading. British Savoury: Add bangers and mash where you can! The British spin on this is not to be knocked until tried. Fry up some Breakfast Pork Sausages and add some mashed potato and you have a heavy and delicious breakfast! If you’re feeling extra adventurous, add some gravy over the finished dish! Funky Chocolate, Peanut Butter & Banana: Black Cat Peanut Butter will do the job perfectly. This sweet and savoury delight will pack out your pancakes, making them great for sharing. Or have it all for yourself, we won’t judge. Thick American Blueberry: To thicken them up, simply add baking powder and self-raising flour and get liberal with the syrup. There’s no need to stick to blueberries either – grab yourself a selection of your family’s favourite fruits and let everyone help themselves. We love the versatility of pancakes, so unleash your imagination and make the pancakes you and your loved ones will remember at least until the next Pancake Day! Remember to show us your creations on Twitter using #ForTheLoveOfFood … We look forward to seeing your pancake flops and wins!